Most folks enjoy eating oysters — but students working with the North Carolina Coastal Federation like to also learn about why oysters are so valuable to the environment. The federation’s multifaceted Oyster Education Program connects students to the coast using the oyster in the classroom and in the field. The classroom and field activities are correlated to the North Carolina Standard Course of Study objectives for high school grades to help teachers integrate the program into their courses. Federation educators work with schools in all three coastal regions through the program. Oyster education extends beyond the classroom and includes different involvement from each educator, but all discuss the importance of oysters when bringing groups out to the field to work on living shoreline projects or oyster reef construction. In the northeast region, educator Sara Hallas has done plankton labs with middle school students, who identify species of plankton under microscopes. Currently, she also incorporates education about oysters at volunteer events on Roanoke Island, where the federation is building oyster reefs. Rachel Bisesi, the central region’s educator, has worked with Carteret County high schools on oyster dissections, bagging oyster shells for oyster reef construction and building oyster reefs in the field. In the southeast region, educator Ted Wilgis conducts an oyster ecology and dissection lesson that introduces students to the function and value of oysters. The classroom work is followed by a field trip to an oyster restoration site where students help to build, maintain and monitor oyster reefs. Have a fun learning experience. 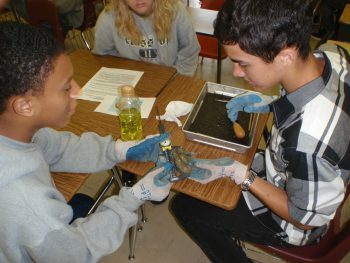 Students dissect oysters before heading out to a restoration activity. 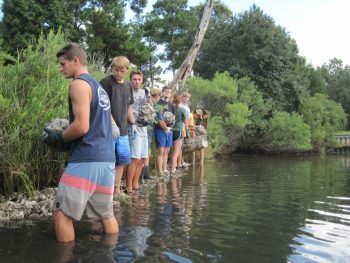 Students line up and pass along oyster bags at an oyster reef construction. 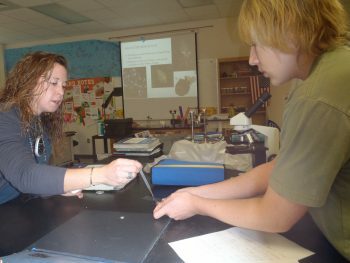 Educator Sara Hallas guides a student during an oyster lab. Why the oyster? Oysters are top-notch water filters, improving water quality by removing sediment, nutrients and plankton from the water as they feed. One adult oyster can filter up to 50 gallons of water a day. Oyster reefs provide critical habitat for a diverse collection of aquatic animals, including many important commercial and recreational fish species. Oysters also are an important link in the estuarine food chain, and they are an important recreational and commercial fishery. Read more about our oyster habitat restoration program. The federation works with numerous schools on its oyster projects. If you are interested in learning more about the federation’s educational opportunities for students, please contact one of our educational coordinators: Rachel Bisesi, Sara Jean Hallas or Ted Wilgis.